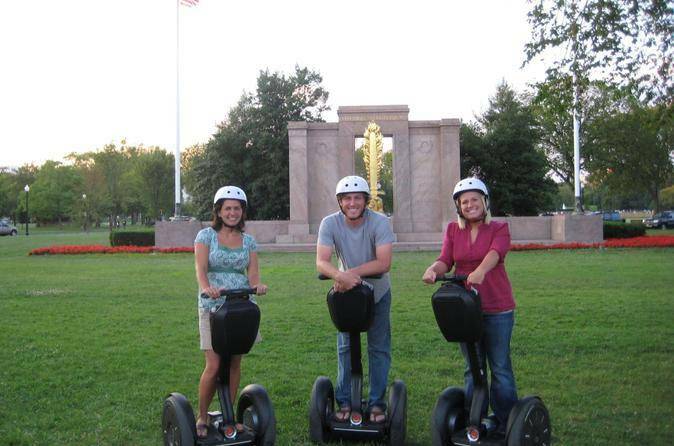 The Washington D.C. Segway Night Tour is the only way to see DC at sunset and at night. Be part of it and not stuck behind bus windows listening to boring commentary. Instead ride a Segway and you'll see DC as it was meant to be enjoyed! Your tour begins with a 30-minute training session to learn the basics of maneuvering the Segway scooter. Once under way, visit Washington D.C. highlights, including: the U.S. Capitol Building, the White House, the National Museum of Natural History, Ford's Theater, the Washington Monument, and many more! Your tour guide also takes you past the National Gallery of Art, the National Museum of American History, and the U.S. Navy Memorial. Throughout the tour, the guide provides both the history and stories surrounding the sites and makes sure plenty of photo opportunities are available. All tours are limited in size with 1 guide so you can count on a great, intimate experience. Discover what it's like to be a celebrity as everyone turns to watch you glide by! All riders must be at least 16 years of age to participate. Each party must also complete a damage waiver that includes leaving a credit card on file for the duration of the tour. Please have one person in your party bring a Visa, MasterCard, American Express or Discover to complete this waiver.